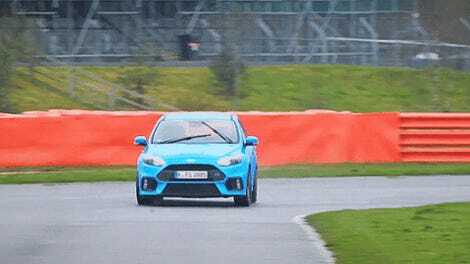 We’re all thankful that the Ford Focus RS, an overpowered all-wheel drive hot hatchback with “drift mode,” even exists. But I know I’m not the only one who’s wondering how close its actual wheel horsepower is to the factory claim. And while we’re on the subject—how much power can you make with modifications? These dyno runs have some insight. Early on in the lead-up to the car’s release, it was said to be rated to 320 horsepower. Our loins were girded when the official Ford claim turned out to be 350 horsepower at 6,000 RPM with 350 lb-ft of torque at 3,200 RPM. But as you may know, those factory claim numbers are measured at the crank, and don’t account for the drag we call “parasitic loss” through the drivetrain and wheels. So the power you feel will always be a little lower than the manufacturing specs. To find out what a car’s really putting to the ground you need to put it on a dyno, which measures the power at the wheels. So that’s exactly what automotive journalist Matt Farah of The Smoking Tire has just done on his own Focus RS. Sorry, you missed the opportunity to guess and win his prize, but you do get to see the results of the test. Stock, the car put down a baseline of 322 HP and 352 lb-ft of torque. With Focus RS tuner Mountune’s “B3” package, which includes a high-flow air intake and engine computer recalibration for about $1,500, the car went up to 346 HP and 441 lb-ft of torque. On Instagram, Farah explained that these numbers are off a Mustang wind tunnel dyno, “corrected for weather,” and made with the car running 91 octane pump gas. 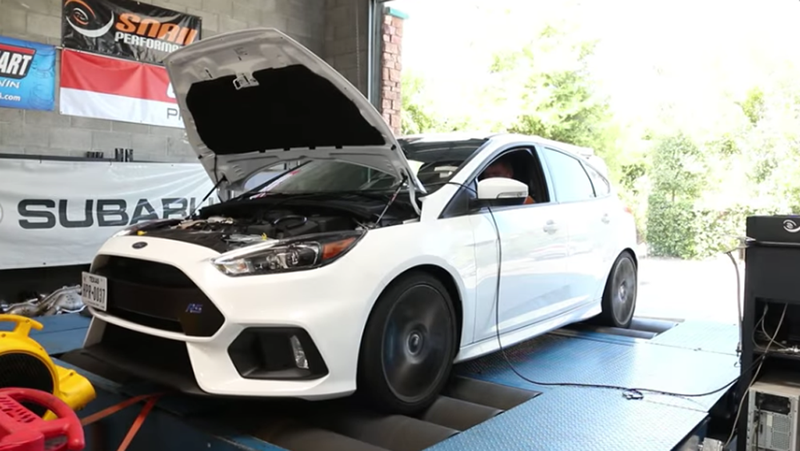 The Snail video makes it clear that the Focus RS’s RDU was disconnected, effectively rendering the car front-wheel drive so it could be measured on a two-wheel drive dyno. They also get a little more into how different modifications affect the car, and how the RS compares to a Subaru WRX STI. I still think the way a car feels is more important than what it looks like on paper, but I’m always curious to see how close cars come to their factory claims and what kind of “wake-up” you can buy with a tune. I’m looking forward to seeing some more of these things measured and modified.